■ Numbers of Latvia are temporary unavailable. Due to cellular operator failure, all existing numbers require re-activation, what we are doing right now. It may take several weeks to recover. ■ On Sunday, April 21st, we are online from 11 am till 3 pm (11:00 - 15:00) GMT. Welcome! 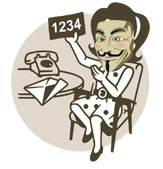 Need own phone number for anonymous SMS? VPN and Proxy on demand: ordinal (like popular VPN services), STunnel, dedicated IP, bi-directional etc. VPS based.